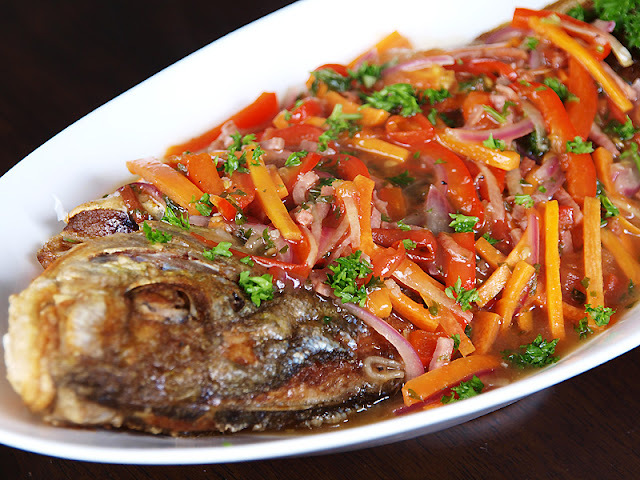 Escabeche, the sweet and sour version of the Western World, introduced by the Spanish to the Philippines during the 1500′s. It is a typical Mediterranean cuisine and which made out of poached or fried fish then marinated in an acidic mixture like vinegar or any citric juice before serving. The dish is not just common in Spain but as well as in Panama, Peru, Puerto Rico, Mexico and Philippines. 1 Clean the fish and slit it open. Season the fish all over with 1 tablespoon of the salt. 2 Whisk the vinegar, water, sugar and the remaining salt in a small non-reactive bowl until the sugar and salt have dissolved. Set aside. 3 Heat the oil in a skillet and fry the fish until crisp and light golden brown, about 7 minutes on each side. Remove the fish from the skillet and set aside to drain. 4 In the same skillet, stir-fry the garlic until golden brown, then add the onion and stir-fry until translucent. Add the ginger and the vinegar mixture and bring to a boil. Add the bell pepper, celery, carrot and spring onions, and mix well. Add the cornstarch and stir to dissolve. Reduce the heat and simmer for 5 minutes or until the sauce thickens. 5 Transfer the fish to a serving platter and spoon the cooked vegetables over it. Serve hot with a small bowl of the sauce on the side.